We all love music, or some kind of music. It’s universal, right? As in, not belonging to me or you…per se. Ahhh… I’ll admit it, I’ve found my escape during rough times more than once through listening to a great song. When I was down and out in my teen years, singing along with a favorite band at the top of my lungs gave me super-powers (or so I thought) that helped make me resistant to the not-so-nice things that can happen in life. So, naturally, singing was the only thing I wanted to do for the rest of my life. No, really, I felt like if I didn’t sing and write songs as a career I would burst into a thousand unrealized, unexpressed pieces. So, after I did the responsible thing and got a Bachelor’s of Science in Exercise Physiology from UCDavis, I set out to become a singer! And much to the shocked surprise and relief of my parents, I did eventually make a career of it – in the city of angels no less…that sprawl of gorgeous California coastline movie stars call home. Never-mind the brown haze known as smog that lays over the city in the heat of the summer until the disgustingly warm Santa Ana winds chase it away in the fall, or the earthquakes, mudslides, and fires. I loved it! I toured with an amazing, rock’n’ roll hall of fame artist named Jackson Browne as his background singer for several years. We performed at the Staples center on New Year’s Eve, 1999 in front of twenty thousand people, and opened for Tom Petty and the Eagles on a few tours. Jackson Browne has a gifted band and they rocked all the shows, with Jackson leading the way as always. I considered myself very lucky when Jackson’s band members approached me to write songs and record with them. We formed our own band called, Love Nugget and had a blast performing in LA. Songwriting became my huge passion and I recorded an album of my own songs called, the Woman in the Moon. 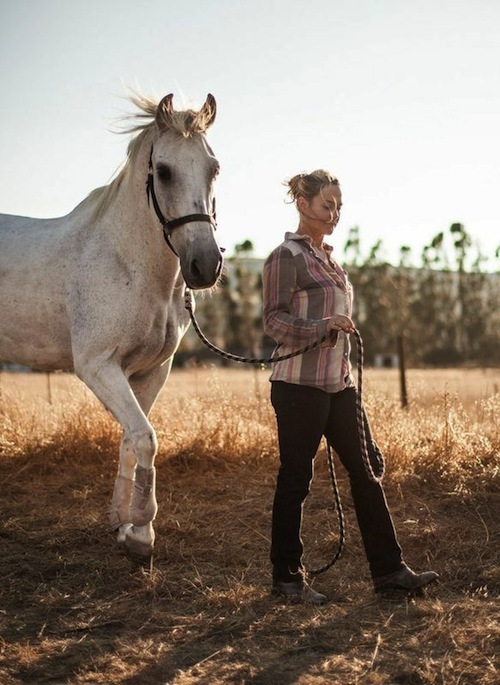 After I married my husband and we moved to the rural hills of Topanga Canyon, I became obsessed with horses (move over music!) just like I had been when I was a little girl. I mean, it was ridiculous. My husband would shake his head, as he watched me bring home book after book with horses splashed on the covers, and spend hours on dreamhorse.com, searching for a horse of my own. Horses were like music – passionate, healing, wordless, universal forces of nature. They led me on a sort of quest into all these really amazing experiences. I completed a year-long apprenticeship with the author of the Tao of Equus, Linda Kohanov. During this time, I found the horse of my dreams (all that searching paid off ) and teamed up with him to work with humans in a field called Equine Experiential Learning. I also apprenticed with a Native American teacher, Maria Yraceburu, and together we presented a very basic version of the Lakota Horse Dance for like-minded friends in the community. Horses and humans partnering together made sense. Humans can be kind of clueless at times, but teaming up with animals and nature seemed to bring out the best in us…yes, me too. Me most of all! Then it happened. While staying at a resort called Poet’s Cove (of all things), I met a woman who told me about an amazing video involving horses. A flood in the Netherlands had stranded two-hundred horses, who were rescued by four women (two were teens) on horse-back. And they filmed the rescue! The video brought tears to my eyes. I began thinking…what if someone wrote a story based on this? My husband (who is a screenwriter) said, “what if that someone was you?” This was the original inspiration for Christa’s Luck. And poor Michael had to live up to his challenge, because being a songwriter did not prepare me for writing a novel. You should’ve seen him trying to teach me the basics of plot, structure, dialogue… the whole nine yards. Well, I caught on after a few years, (ha!) I’m a quick study. While researching for Christa’s Luck, I became aware of a tragic real-life story unfolding in the western United States. Wild mustangs were being rounded up from the public ranges in numbers so massive, they would all but be extinct in ten years. I couldn’t believe it! Horses are a symbol of freedom. The fact that we were destroying their freedom seemed an unbearable irony, and a strong mirror for how we might be imprisoning and limiting our own wildness. Ouch. It hurt to follow their story, but we hoped writing about them could give them a voice. Besides Christa, Lucky, Jenner, Sara, Kim, Cisco, and Amy… the wild Mustangs are the stars of the novel!